Bamboo Batu, Bambu Batu, what the heck’s a Batu anyway? Since Bambu Batu first opened in 2006, a lot of people have come in asking, “What’s a Batu?” Now we also call the shop the House of Bamboo, so a lot of people guess that Batu means House. And a lot of people try to spell it Bamboo Batu. I’m sorry to point it out, but I’m afraid they’re both wrong. The phrase Bambu Batu actually comes from Malay, an Indonesian language spoken by nearly 300 million people, hence the exotic spelling. And it’s the name of a very specific variety of bamboo. The botanical name of that species is Dendrocalamus Strictus. But in English it’s more commonly referred to as Male Bamboo, Solid Bamboo, Iron Bamboo, or Calcutta Bamboo. In Malay, the word Batu by itself means rock; so the literal translation of the name would be something like Rock Bamboo or Stony Bamboo. The fact is, this particular variety of bamboo is extremely hard and resilient to cracking. Oftentimes it is also solid, or very nearly solid, rather than being completely hollow like most types of bamboo that we are familiar with. For all of these reason, Dendrocalamus Strictus is a top choice as a construction material and for building furniture. It also seems like a solid foundation on which to build a business. “And upon this rock I build my house.” Last but not least, the name Bambu Batu just rolls off the tongue so nicely. It’s pretty much impossible to say it without cracking a smile. Go ahead, try it. What else do we know about this exotic very of bamboo that’s so much fun to pronounce? Growing to heights of 60 feet or more, with canes up to 5″ in diameter, Bambu Batu is a giant clumper. This giant, tropical timber bamboo is native to southeast Asia and the Indonesian archipelago. It is widespread in India, but can also be found in Central America and Cuba. Young shoots are powdery bluish in color, but gradually turn green and then dark yellow or brown as they mature. It is considered the supreme variety for furniture and construction. For a short time, it was a dream of mine to grow some Bambu Batu in my backyard. While many varieties of bamboo grow commonly throughout California and are widely available in nurseries, Dendrocalamus Strictus remains pretty difficult to come by, even from large online bamboo dealers. I suppose it would be different if I lived in Vietnam or maybe Colombia, but California is not the climate for this species. Furthermore, despite its impressive size, and the fact that it’s a clumper rather than a runner, Bambu Batu doesn’t seem to be the most desirable strain. This massive bamboo is not nearly as attractive as some other timber varieties, like the Vivax for example. So in the end, I put the idea to rest, and settled for several other species that would be much happier growing on California’s central coast. By the way, if you’re trying to pick some out for yourself, check out this great article on selecting the best bamboo varieties for your garden. Finally, if you’re planning to build a House of Bamboo, the Bambu Batu might be your best bet. But if you’re looking to plant a garden, you better maybe think twice, And then remember to ask for it by name, Dendrocalamus Strictus. 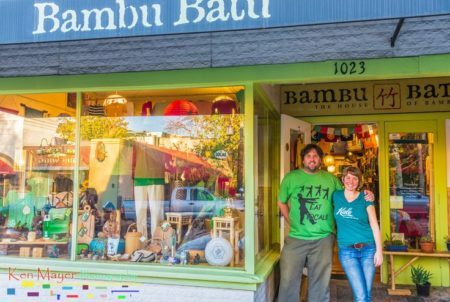 Featured Image: Bambu Batu owners Jon and Anna, in downtown San Luis Obispo. This week marks the fifth anniversary of what has become something of an institution here at Bambu Batu. Art After Dark in SLO takes place on the first Friday of each month, and shopkeepers and art-lovers alike have come to look forward to this monthly opportunity for mingling and moseying around San Luis Obispo’s charming, historic downtown district. From 6-9 pm, most participating venues will host art openings that showcase artwork ranging from local oil paintings to international textiles, and everything in between. Small but cultured, San Luis Obispo boasts a flourishing community of artists, including world-class plein air specialists, award-winning jewelers, a growing cottage industry of crafters, an active and talented cadre of painters both abstract and representational, and all manner of sculptors and ceramicists. Alongside these diverse and abundant exhibits—around thirty each month—most galleries offer something else for which our region has earned an impressive reputation, glasses of fine wine. In our unending effort to distinguish ourselves, Bambu Batu takes a unique approach to Art After Dark in SLO. As our wall space is already well filled with lovely art, scrolls and bamboo merchandise, we generally try to focus on other forms of art. Each month we feature a different line-up of local musical artists, from gypsy jazz ensembles to ambient DJs to singer-songwriter soloists (including Anthony Roselli in the photo above). Tonight (Oct. 2, 2015), our special guests include and handful of members from SLO county’s notorious bluegrass sensation, the Mother Cornshuckers. As a spiritually oriented shop, we also take Art After Dark as an opportunity to showcase the metaphysical arts. Harry Farmer, the impresario of astrology on the Central Coast, participates on a semi regular basis, offering his most insightful readings of your planets based on decades of study and experience. Mary-Aiñe Curtis also offers her intuitive talents on alternating months, using Angel Cards to exercise her sensitive energy reading skills. Finally, given this region’s saturation of grapes and wineries, we opt to offer another much loved but under-represented exemplar of the fermented arts: craft beer. Typically we pour suds from either Creekside Brewing Company (brewed and based directly across the street) or Figueroa Mountain Brewing (based in Santa Ynez and brewed in nearby Arroyo Grande). Beer and wine lovers alike appear to appreciate our bold efforts to diversify the palate. Bambu Batu is proud to be a part of Art After Dark in SLO, and whenever possible we also include arts and crafts from local artisans, to brighten up the evening’s fare and give budding artists a chance to gain some exposure and display their works. And at last we can rejoice, that Bubblegum Alley is no longer San Luis Obispo’s greatest contribution to culture! The 2015 Central Coast Sustainability Festival takes place this Saturday, May 2, at Mission Plaza in downtown San Luis Obispo. 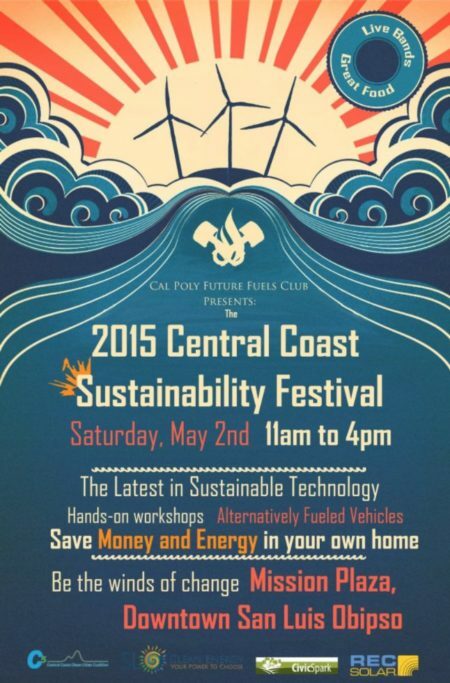 The festival, hosted by the Cal Poly Future Fuels Club, will feature bands, companies, alternative fuel and electric vehicles, and other projects all with one goal: making the world we live in more sustainable. 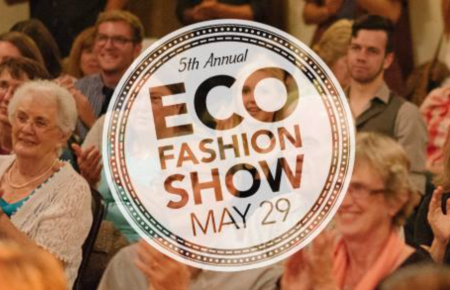 Up to 30 businesses will be exhibiting their sustainable tech and cars, 2 bands (including San Luis Obispo’s own Louder Space, and Attic Empire), and several food vendors will be there! The elusive and illustrious See Canyon Ramblers are making a rare appearance in downtown SLO this Friday, Oct. 3, out of their Oceano cavern and straight onto center stage for Art After Dark at Bambu Batu. In addition to the toe-tapping tunes of this bluegrass fusion band (including a few members of the local “beergrass” sensation, the Mother Corn Shuckers), you can always expect a gregarious throng of art enthusiasts, bamboo lovers, new age revelers, and responsible beer consumers. This month’s featured artist, Terri Tylman, creates vibrant, colorful images of tropical visions and local landscapes, using a very unusual technique with color-infused metal. Take advantage of this chance to meet the artist and see her work in person, because I’m having a hard time describing it in words! Friday’s line-up also includes local astrologer Harry Farmer and intuitive angel card reader MaryAiñe Curtis, at your service to help you wrap your mind around your soul’s path and your cosmic destiny. If that’s not enough to bring the inner peace you seek, perhaps a cold beer from Creekside Brewing Company will do the trick. We always have a few varieties on hand, from the palest ale to the deepest darkest porter, and brewed so locally you can literally see their raw grains from here. And chances are, you’re really going to want a cold drink come Friday night, because this weekend is supposed to get hot hot hot. I’m not saying it has anything to do with Climate Change, but possible triple digit temps as the worst drought in California history intensifies, and you can decide for yourself. And if you’re familiar with the Indian Summers for which the Central Coast is famous, you might even take the opportunity to pick up a nice, light-weight bamboo tank top to help get you through the season. Whatever your needs may be, we hope you’ll join us for this next edition of Art After Dark, because we know it will put a smile on your face.